There are already a lot of things that a smart poll-watcher has to account for when comparing surveys. Were they done by the same pollster? Did they query the same type of population (likely voters, registered voters, all adults)? To this list, the volatile 2020 Democratic primary field has added one more: Do they ask about the same candidates? “The candidates in the survey make a material difference,” Mike Greenfield, co-founder and CEO of the pollster Change Research, told FiveThirtyEight in an email. For example, when Change Research polled the nation in December, Joe Biden received 21 percent support, and Bernie Sanders received 16 percent. But when they polled the country again in early March, Biden had jumped to 36 percent and Sanders sat at 24 percent. But we can’t confidently say based on those two polls alone that Biden and Sanders had actually gained ground with the electorate. Why? The March poll did not give respondents the option to choose eight politicians who appeared in the December poll2 and had combined for 17 percentage points, substituting them with 10 new names of late-breaking candidates, like South Bend, Indiana, Mayor Pete Buttigieg and Washington Gov. Jay Inslee. Many voters whose first choice had dropped off the list switched to Biden and Sanders in the latter poll, Greenfield said. However, “even with that challenge, you can still tease out some very meaningful changes.” For example, Greenfield said that Beto O’Rourke’s dip in support from 21 percent in December to 7 percent in March can’t be accounted for by different candidate rosters alone. Likewise, between two David Binder Research polls of Iowa (also in December and March), it’s unclear which candidates’ polling bumps were organic and how much of a bump or decline was due to respondents being offered different choices. The March poll did not ask about four candidates who totaled 7 percentage points combined in December; meanwhile, the December poll didn’t ask about 12 candidates who combined for 12 points in March. The good news is that, in most polls, the candidates who are rotated in or out are polling poorly, so it doesn’t make a huge difference whether they’re included or excluded. Plus, there can be good reasons for a pollster to update the roster of candidates it asks about; it’s important that a poll reflect the most up-to-date state of the race (e.g., Bloomberg looks like less of a factor now than he did in December, and Buttigieg looks like more of one). Out of 86 poll questions overall. One poll may have multiple questions. In sum, the fluid field is one reason not to read too much into early 2020 polls. When comparing polls — even when they’re from the same pollster — take care that the candidate rosters don’t differ too much. And the next time you see a surprising result, make sure you scan the list of candidates to make sure no big-name potential candidates are unduly included or excluded. 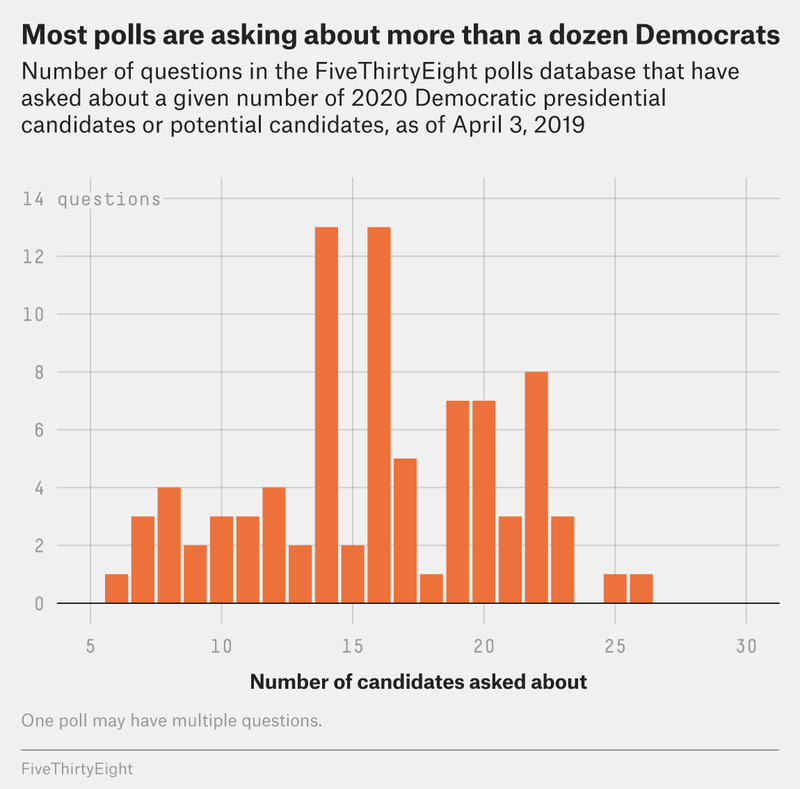 Overall, the most useful 2020 polls are those that come as close as possible to the final list of candidates that will appear on ballots in less than a year’s time. Of course, the trick is guessing right. This is a big part of why we use Morning Consult polling when judging how big of a bump candidates get from their campaign kickoffs. In addition to polling thousands of Democrats every week, Morning Consult is conservative about changing the names it asks about. In the last seven weeks, it has only altered its candidate roster once, to reflect the fact that former New York City Mayor Michael Bloomberg, Ohio Sen. Sherrod Brown and former Attorney General Eric Holder announced they would not run. Former Secretary of State Hillary Clinton, Rep. Joe Kennedy III, Bloomberg, Brown, Holder, former Secretary of State John Kerry, billionaire Tom Steyer and billionaire Howard Schultz.